I had served in HMNZS MONOWAI at various times since the New Zealand Navy had taken her over and converted her between 1975 and 78. Indeed, I joined the Navy the year MONOWAI was taken over so we had a very close association and more than half of my service was in the ship. I took command of MONOWAI at the end of January 1994 and in the middle of that year we sailed from Auckland for a planned 3 month deployment to the South Pacific Islands. Our intention was to undertake surveying work in Tonga, and around the Northern Cook group, especially at the atoll of Penrhyn. We sailed from Auckland on the 31 st of May. We had a few problems with the port main engine on the way north towards our 1 st stop at Raoul Island in the Kermadecs where we were to re-supply the weather station. The salt water cooling system on the port main engine had given us a few problems during survey work in Fiordland earlier in the year. The problem had been "fixed" during the maintenance period before the deployment but proved troublesome during the 1st few days of the deployment. We were thus late in getting to Raoul Island and although the troops worked with a will and we pressed all the boats into service and used the Wasp helicopter in over 80 flights in an effort to get all the stores ashore we did not succeed by the time that night fell. We had planned about 2 spare days in to the passage to Tonga for investigations en route so I elected to remain at anchor overnight on the northern side of Raoul Island and to complete the discharge next morning. So, at 0600 on the Saturday morning we started again; finished about 0900 and set courses northwards towards Tonga. We were not more than about an hour out from Raoul Island when we received a call for assistance from the Island. One of the Conservation Department volunteers that we had taken up had gashed her thigh while unloading some of the pieces of corrugated iron from the tractor and trailer that they had been using to move the gear around. So we altered course back toward the island, got the Wasp prepared and the pilot, Derek Monaghan, flew the ship's doctor, John Talbot, and the medic, LMA Wiig, in to Raoul to see what they could do. Because of the planned length of the deployment the ship was carrying an orthopaedic surgeon from Christchurch, John Talbot, who was a surgeon lieutenant commander in the Reserves. So it was about 1100 on the Saturday morning, 3rd June 1994, when we finally headed away from Raoul Island. It was a beautiful day, everything you could wish for a South Pacific deployment. The sun coruscating across the calm sea, just a very gentle swell and the ship heading purposefully north. While we were at anchor on the Friday I had listened to a VHF conversation between a yacht in the other anchorage at Raoul and the weather station discussing the weather situation and the likely forecast. The guy on Raoul Island had indicated that the weather looked reasonably good although he did call attention to a depression that appeared to be forming over Fiji. I had not previously noticed this system forming, so watched our fax records as they came through. I noted that the depression was deepening and moving steadily towards the south east. That did not concern me at all as it was clearly going to pass south of MONOWAI's track. Indeed, I recall saying to one of the watch keeping officers as the fax came in "Gosh, I would not like to be in the way of that lot" pointing to the depression. Prescient words indeed. Around midday that day we received a signal asking us to alter course to the south west and proceed to a position where a yacht was experiencing difficulties. This yacht, the 'Mary T' was reported to have four people on board, two of the crew were disabled due to the motion and she was taking on water. She had thus issued a PAN warning indicating that she was requiring some assistance but was not actually in a full state of distress. I was somewhat puzzled by the request as the position given for 'Mary T' was some 420 miles from our current position. However we altered course anyway while we sorted the matter out. It later transpired that our position had been wrongly transmitted that morning (we were close to the dateline and our 'west' longitude had been wrongly transmitted as 'east') and it was believed that we were within 70 miles of the yacht. However, by the time we had sorted this out and it had been established that another vessel was closer, various yachts were reporting themselves in distress down in that part of the ocean so we carried on our south westerly course. As we did so the sea conditions slowly built up. As the depression was on our starboard beam, that is to the north west, the seas were also coming in from the beam and the rolling of the ship built up as we moved towards the reported positions. By the evening time the sea had built up such that the ship was rolling about 35 degrees either way. My lasting impression was of the old sailing ships rounding Cape Horn. The ship would roll one way, water would sluice along the main deck (6 ½ metres above the waterline), the ship would give a bit of a shudder and then roll the other way and water would then foam down the other side of the deck. It was particularly impressive at night as the back-scatter from the navlights caught the phosphorescent foam! The ship was in no immediate danger and I felt that it was important that we maintain our course directly towards the yachts. We had some problems from scuttles (portholes) leaking. These scuttles were normally above the water line and are perhaps described as 'water resistant'. They certainly were not designed to be submerged for a number of seconds at a time. We also suffered the ingress of water from around the main doors from the accommodation out onto the main deck. As she rolled the ship was being hit with the occasional wave and water was seeping in from around the wooden edge of the doors. Under normal circumstances this was not a problem. However that night it made for slippery and dangerous conditions inside and we had a lot of the junior ratings up through the evening mopping up. Indeed at one stage, about 2200 (10 o'clock), I had been into my pantry and as I came out I did a glorious cartoon-like slip and landed heavily on to my wrist and arm. I remember thinking 'that is all we need in a situation like this, isn't it - the Captain with a broken arm!' Fortunately, although the wrist still troubles me, it was nothing serious. There was not much sleep to be had that night. The heavy and continuous rolling of the ship made it more than a little tedious and the wooden joinery and the partitioning inside the ship creaked and groaned somewhat alarmingly. My cabin, as I recall, looked something like a train crash. The loose furniture, the upright chairs, had been laid down on the deck under the table as was our normal practice, but with the considerable motion of the ship these had been sliding around the cabin. My steward had secured them in the corner of the cabin using a couple of heaving lines. The armchairs in the corner and the table were attached to the bulkhead so they were not a problem. In my sleeping cabin I found that no matter how well one tried to stow one's gear there seemed always to be something to roll around to keep one awake. It took me several goes to get to the stage where any mobile items such as cans of coke and the like were sufficiently jammed by towels, jumpers and so on. Around midnight with the ship rolling 35-40 degrees either way I ordered an alteration of course about 40 degrees to starboard to put the sea more on the bow and to ease the rolling of the ship. The senior ratings' beer cooler which had been installed in the ship some 17 years earlier pulled away from the bulkhead and other fixed equipment was showing similar signs of strain. The only cargo or non ship fittings to carry away, a couple of drums of cleaning liquid down in the forward hold, had sprung their lashings and destroyed the PTI's bicycle. It occurred to me that we would be no use to anyone if we arrived in the position having destroyed ourselves in the process. We had only been able to make about 5 knots with the sea on the beam and our speed increased to at least 6 ½ knots with the sea on the bow. So the penalty of longer distance was ameliorated slightly by the small advance in speed. There was, however, still a lot of motion! I lay on my bunk trying to get at least some rest although my efforts here were thwarted by having finally secured the drawers when the magnetic stays finally gave way. The drawers would open and shut as the ship rolled, with a suitably loud clunk each time. I ended up with all of my cabin drawers laid out neatly across the deck after copious applications of masking tape had failed to equal the strain. Shortly before 4 in the morning I was phoned by the officer of the watch, Lieutenant Andrew Saunderson, who advised me that he had seen a bright light in the sky which he considered might have been a flare. He asked that I join him on the bridge. It was pitch black with no sign of any moon. It was raining heavily and there was a large sea running, a huge swell. The ship was still rolling very heavily. Altogether not a very prepossessing situation. Andrew described what he had seen as a 'bright white sudden flash of light'. In discussing it we decided that it did not sound much like a standard distress flare because those of course are normally red, or if a white flare is fired it is normally a parachute flare and thus of long duration. We decided that it was probably a meteorological phenomenon of one kind or another (I had seen something similar once when I was on watch on a lovely still evening when a meteor had ended in a flash which lit up the ship like a camera's flash gun). However, as Andrew did not seem totally convinced I said that we would put out a call on the VHF, a radio system which has a relatively short range of perhaps 20-25 miles, and if there was anyone around in that part of the ocean - which I thought doubtful - then we would be able to discuss the nature of their problem. So I picked up the VHF radio and put out a blind call on channel 16 saying "This is warship MONOWAI in position .. Any vessel sighting or firing a white flare is requested to communicate. Warship MONOWAI listening - Out". I turned to Andrew and said "There you are. Nothing". To my very great surprise suddenly the radio crackled into life. An Australian yacht, 'Ramtha' indicated they too had seen a bright light - albeit that what they saw was green or orange. The position they gave was some 15 miles ahead of us and it was obvious that no flare would be seen over that distance which reinforced my view about it being a natural phenomenon. We discussed the situation with 'Ramtha'. I was speaking with a female on board the boat and they indicated that they were having a pretty dreadful time. She indicated that her husband said he was "having a pretty bloody time of it" and if "someone could take him off he'd go". I was a bit flummoxed by this because it did not sound like the standard call of distress that one is trained to expect. After a couple of moments thought I said "Yes, I know exactly how your husband feels madam, if someone could take me off of here I would go too". Well that rather served to keep them quiet for a while, but, essentially I indicated that we were on our way to a vessel which had issued an urgency call and that if 'Ramtha' was not in any immediate need of assistance I would report their position, course and speed to rescue co-ordination centre in Wellington. However I told them we would keep a listening watch should matters develop. I decided that there was not much sleep to be had down below . I propped myself in the Captain's chair on the bridge to gain whatever amount of doze I could. Around 0430 the radio came to life again and it was 'Ramtha'. They indicated that they had taken a very large roll, lost the little bit of mainsail that they had out, their steering had been damaged and they now considered their situation to be dire. They asked if they could be taken off. Well this was very much more what I expected from a distress call but, given the conditions at the time, I said that I would stay in the area until daylight, about 2 hours later and we could perhaps assess the situation at that stage. We therefore continued our slow progress towards 'Ramtha's' position. It was some what worrying to know there was another small vessel out there as we could see very little on the radar screen due to the incredible amount of clutter from the wave tops. At 0600 we called the hands early and advised them of the situation and put them on standby. As day dawned the actual weather conditions became clearer. The height of eye on MONOWAI's bridge was a little over 11 metres and the mountainous seas at times towered over the bridge wing with the crests of some waves breaking well over our heads. At other times we appeared to be sitting upon a mountain top in a manner akin to the ark on Mount Ararat and could see for miles. The rain was horizontal. It was grey and grim. The anemometer showed the true wind to be a steady 60-65 knots with gusts over (sometimes well-over!) 80 knots. The air was full of wind driven spume. It was readily apparent that there was absolutely no possibility of bringing MONOWAI alongside Ramtha in such conditions. The traditional rescue method is for the ship to bring herself alongside the yacht upwind with cargo nets, ladders etc rigged on the lee side. The yachts crew would then climb nimbly up the nets to safety. This, indeed, was the method used by the 'Nomadic Duchess' and 'Tui Cakau III' in their rescues during the operation and I am still very impressed by these feats of seamanship. MONOWAI, though, was still rolling violently and ship handling was somewhat variable - to say the least. So this option was very quickly dismissed. I discussed the situation with my Executive Officer, Lieutenant Commander Hugh Aitken, and the possibility of floating a life buoy attached to a line across to the yacht was considered. Ultimately, and I have to say that it was not my idea, we decided that a more certain method was to use our line throwing rifle to pass Ramtha a line to which would be attached 2 rescue harnesses. We decided that we would pass these harnesses across to the crew of Ramtha and instruct them that on our signal they were to enter the water and we would then pull them across to the ship. We briefed the Chief Bosun's Mate (CPOS Nathan) and the ship's Petty Officer Seaman (POS Jackson) accordingly. They mustered the seamen and surveyor ratings in the forward vehicle deck and prepared the equipment. We had a lot of trouble keeping sight of Ramtha from the bridge due to the sea conditions. Indeed on more than one occasion we had to ask Ramtha for an approximate compass bearing of us from the yacht so that we could reverse the calculation to eyeball the yacht. We could often only locate them by seeing the mast break the horizon. We had all our deck lights turned on so that Ramtha could see us. The radar was totally useless in such conditions. A complicating factor was that at the very slow speeds we were doing to maintain our position and manoeuvre towards Ramtha, the rolling of the ship caused the main engine cooling water intakes (which are well down towards the keel) to come out of the water and the consequent intake of air would cause one or other of the engines to overheat momentarily and to shut itself down. I endeavoured to remain calm and phlegmatic under such trying circumstances though that was far from the way I was feeling. We made our first approach to Ramtha and it was about that stage that the enormity of the task ahead came to me. When we were a few minutes away from the yacht we called the fo'c'sle crew up on deck to prepare the recovery lines. The deck crew were wearing life jackets but we felt that lifelines themselves would be more of a hindrance than a help except for the 2 gunners who would need to position themselves at the rail. The deck crew were quite stoic as they prepared the lines on the starboard side for example. MONOWAI would take a large roll, fall off a wave and it was apparent that we were then lining up for a port side approach. They would quickly unshackle the line and move it over to the other side in time to for the operation to be repeated in reverse. Ship handling was far from certain and my earlier views that putting MONOWAI alongside Ramtha was not a viable option were well justified. 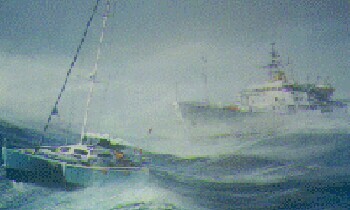 We made our approach and ended up with Ramtha close by our starboard side at about 20 metres off. The line was fired and taken in hand by Robin Forbes but to our great chagrin we saw the line break. By the time the gun line had been recovered the two vessels had blown a considerable distance apart despite my best efforts with engines and bow thruster. We would lumber around in a large circle and make another approach. At the due moment the fo'c'sle crew were called on deck and the earlier processes repeated. The manoeuvring and the slow speed caused the ship to roll considerably and at one stage our instruments recorded a roll of some 48 ° . I was never terribly concerned for the safety of the ship as a whole. MONOWAI was only 4 days out of port and thus had an almost full complement of fuel and water in her double bottom tanks low down in the ship. I was aware from the ship's stability information that her angle of maximum stability under such conditions was 58 degrees whilst in theory her stability does not go negative until 88 ° . Theory I reflected is a wonderful thing and I felt that given my experiences with the cabin furniture, and the senior ratings beer cooler the night before that long before 88 ° everything on the high side of the ship would be joining all of us on the low side and the equation would be rapidly changing. I was more concerned for the safety of the deck crew because had any of them slipped and fallen through the guard rails then I doubt that we would ever have seen anything of them again. However, they too had obviously been well briefed or had a well developed sense of self preservation because I noticed that they were all holding on incredibly tightly. Life for the non-seamen/surveyors however, appeared to be proceeding as normal. I had one report that there had been an accident to one of our female sailors who had fallen over in the shower that morning and had unfortunately broken her front tooth. I was somewhat amazed that anyone would even be trying to shower in those conditions. I also received a more troubling report that one of the communicators had had her foot crushed by the communications office safe which had come free from it's mounting. It later transpired that the safe - which everyone believed to have been attached to the ships structure for the 17 years of her life - was actually just slotted into a cavity in the desk. The safe had actually leapt forward for a distance of about 2 feet. Fortunately the rating's foot was just a little bruised. Frankly I did not need all these distractions. We made 3 more approaches to Ramtha firing lines each time and drifting apart as they variously missed, or on one occasion became entangled in the yachts rigging and had to be cut loose. We commenced our 5 th attempt at around 0950 on that Sunday morning the 5 th of June. I well recall that it was a Sunday as a number of my junior officers were appropriately dressed in their good uniforms in accordance with our Sunday routines. I was dressed in what ever the rating whom I had asked to go down to pick up my clothes could find lying around in my cabin. I must have presented a far from sartorial appearance. The 5th line fired across was fortunately taken in hand by Ramtha and the deck crew having seen the first line break were taking no chances. The line was kept slack at all times and the gun line was attached to a couple of thin heaving lines, which were themselves attached to a slightly thicker line, and the harnesses were paid out on a line which was a little under 25 mm in diameter. Unfortunately this array took a considerable time for Robin Forbes to haul in under the prevailing conditions and with all of this line in the water and my twin controllable pitch propellers spinning at around 220 rpm and the bow thruster similarly running constantly I was considerably agitated about the line in the water. At one stage I believe I may have shut down the port engine from the bridge for fear of becoming entangled. However we saw Robin finally bring the helicopter harnesses in board. We had earlier briefed them that they should put on wetsuits and bring with them any money and passports and other personal documents that they could and that when they donned the harnesses they should ensure that the toggle was very securely fastened in order that they not slip out. My recollection is that Bill placed Robin Forbes' harness over her shoulders first and then his and we saw him reach up to tighten the toggle on her harness. As he did so we lost sight of them. MONOWAI took an extremely large roll to starboard and they disappeared from sight. As we rolled up and back the other way we could see the tension coming out of the line between the ship and the yacht almost in slow motion. Like a rubber band we saw the line jerk tight and Bill and Robyn Forbes were pulled together. They fell. In slow motion I just watched this couple bounce about 4 times on the deck towards the bow of their catamaran. It is surprising how quickly all the dire consequences can run through your mind. If Bill and Robyn Forbes had fallen through the guard-rails or has fallen between the twin hulls then we would have been faced with pulling the catamaran Ramtha towards MONOWAI using them as a toggle. It was therefore with some relief that we saw Bill and Robyn fall into the water just off their starboard bow. I recall hearing an epithet from the fo'c'sle followed by POS Jackson's exhortations to pull them in. And we watched as this couple was pulled through the foaming seas for a distance of about 150 or 200 meters to MONOWAI. They spent quite a lot of the time actually under the water, especially Robyn and I remember remarking to someone at the time that she was obviously under water a lot of the time but we would 'just have to pump her out' when we got her on board. That is one of these throw away remarks that one makes and which keep coming back to haunt one! After about a minute and a half by the navigator yeoman's note book Bill and Robyn were alongside the ship close to the portside under the torpedo davit and not long thereafter they were hoisted up towards the davit and willing arms were reaching out to drag them in board. I was told later that Bills first words on being brought over the deck were "Bloody hell you guys are great". One of the female crewmembers said, "Welcome aboard. Come and have some good kiwi hospitality". Certainly a spontaneous cheer went up as the couple were landed in board and it was clearly a reflection of the tension at the time. We had other yachts to go to and things to do so I re-entered the bridge. Uppermost in my mind was that I had been up since 3:30 in the morning and had not had a cup of tea in the whole of that time - so things were not totally normal aboard the ship. I was also mindful of the fact that I had not had breakfast. Indeed very few of us did but that was the only meal that most of us missed during the 5 days of the operation. My pangs of hunger were being activated by the smell of curry being wafted onto the starboard bridge wing by the galley exhaust fan. I recall being amazed that the chefs were able to keep cooking in what must have been indescribable conditions. As I entered the bridge one of the crew members, an engineer rating, had been observing matter said "Oh well done sir". I was somewhat surprised because the gentleman in question was somewhat quiet and one would not always expect such a quiet rating to be that bold to his CO. I was also greatly heartened because this was a guy I had, with some reluctance I admit, punished with reasonable severity in the preceding weeks. Barry's words moved me immensely and demonstrated the total involvement of all of the 'crew' in what was going down. It was the Ship's Company of MONOWAI who endured all the danger, discomfort and difficulty and I was very proud of what they achieved that day and in the other two rescues we performed during the operation. Without too much ado, though, we set course for the next group requiring our ministrations.